THE HAGUE - The green left party GroenLinks in the Second Chamber of the Dutch Parliament wants the Dutch government to make one million euros annually available for the Nature Trust Fund to protect the fragile nature in Bonaire, St. Eustatius and Saba. GroenLinks also called for a Shark Action Plan. Members of Parliament (MPs) Laura Bromet and Nevin Özütok of GroenLinks submitted a proposal to amend the 2019 budget of Agriculture, Nature and Food Quality during the handling of this budget on Wednesday to secure a yearly contribution of one million euros to the Nature Trust Fund for the Dutch Caribbean. Until 2016, the Dutch government annually contributed to the Dutch Caribbean Nature Alliance (DCNA), an organisation in which all six Dutch Caribbean islands participate in the area of nature management, via the Nature Trust Fund. However, the financial capacity of this trust fund is insufficient to generate sustainable revenue. The one million euros that GroenLinks wants the Dutch government to contribute annually for a maximum period of 10 years would guarantee a sustainable revenue basis. Bromet and Özütok pointed out that the Ministry of Agriculture, Nature and Food Quality was responsible for the management and protection of nature and biodiversity in the entire Netherlands, and therefore also in the Caribbean Netherlands. The proposed budget amendment will be voted on in December. 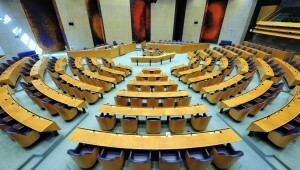 On the second day of the handling of the 2019 budget of Agriculture, Nature and Food Quality on Thursday, Bromet presented a motion that requested that the Dutch government draft a Shark Action Plan on short notice to protect the sharks that live in the seas surrounding the Dutch Caribbean islands. Bromet pointed out in her motion that there are some 25 shark species in the Caribbean Sea, a number of which appear on international endangered species lists. “These sharks deserve more protection,” she said. Sharks play a vital role in the fragile maritime eco-system. Humans who catch sharks for their fins are a major threat. A recent shocking video showed how local fishermen in Curaçao cut the fins off a still-living shark and then threw the animal back in the sea. In her motion, Bromet noted that while the Netherlands has designated a shark reserve around the Saba Bank, there is no active shark protection policy in place. She wants the Shark Action Plan for the Caribbean Netherlands to include research and monitoring of the shark population, actions against illegal shark fishing, the prohibition of “finning” in the law and a strategy to help strengthen the international protection of sharks. Minister of Agriculture, Nature and Food Quality Carola Schouten confirmed that government had already started the drafting of an action plan to protect the sharks in the Caribbean Netherlands. She promised to send this document to Parliament in March next year.